The newly created Jaguar Bloodhound Rapid Response Vehicles will be unveiled at the Goodwood Festival of Speed this week. The RRV’s, as they are being dubbed, are based on the Jaguar XJR and the F-Type AWD R Coupe. They will be for use during the Bloodhound SSC land speed record attempt that is set to be undertaken in South Africa sometime in 2016. For those of you who are lucky enough to get to Goodwood, you can see the F-Type take on the hill in the First Glance Hill Run on Saturday, 27th June, driven by none other than current World Land Speed Record Holder and Bloodhound SCC driver, Andy Green. 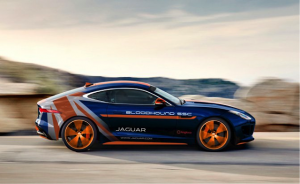 Both the XJR and the F-Type RRV’s feature a rather patriotic bespoke livery created by Jaguar Design that incorporates the Bloodhound SSC colours. The 550PS XJR RRV’s have no rear seats in order to accommodate vital equipment and are fitted with a roll-cage. 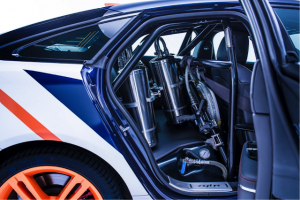 The luxury sedans also feature specially-made housings to carry tools supplied by British manufacturer, Angloco, which include a bespoke foam misting cylinder, a hydraulic pump, motor and hose. The Bloodhound Team will utilise the vehicles throughout the testing and actual speed record attempts to provide potentially lifesaving support to Green, as he attempts to beat the record that he currently holds. The UK-based Bloodhound SCC Project is headed by Richard Noble and Green, who worked together on the Thrust SCC project back in 1997 in the Nevada desert when Green set the current world record speed of 763 mph. The jet and rocket-powered vehicle, which aims to surpass the current record before targeting 1,000mph, has multiple braking systems, including air brakes mounted on the side of the car, which open to increase aerodynamic drag, and disc brakes, used when slowing down from 200mph. However, for a wheeled rocket that’s able to cover a mile in just 3.6 seconds, that’s not enough. There are two backup parachutes to ensure that the 135,000thp (thrust horsepower) vehicle will slow down before the end of the 12-mile strip in Hakskeen Pan. To test the stopping capabilities of the parachutes, Green drove the F-Type to the top speed of 186mph before deploying the chute. You can watch the test run in the video below. Is this the Alfa we have been waiting for? Formula E: the future is boring! Are these the Most Sexist Car Park Spaces ever?